I just returned from a Celebrity Cruise Lines cruise onboard the Celebrity Infinity 3 night cruise to Nassau and CoCo Cay private island in the Bahamas. Due to weather conditions we were not able to port in neither Nassau or Coco Cay. We instead had a sea day and then made port in Freeport, Bahamas. We were one of the first ships to port in Freeport since hurricane Matthew. Shopping in Freeport at the pier was very limited. I did find some fun deals on bracelets and T-shirts. The larger shopping area is about 11 miles from the pier and it is called Port Lucaya Marketplace. It was nice to board a midsize ship after being on Royal Caribbean Allure of the Seas. 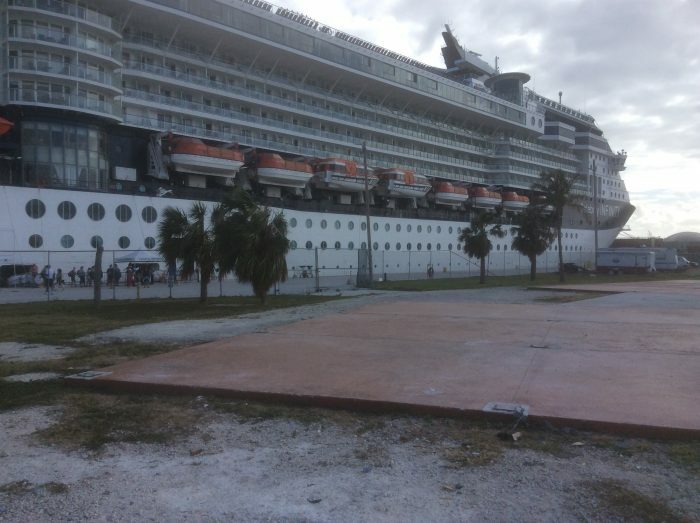 Celebrity Infinity has an occupancy of 2170 guests compared to the Allure of the Seas’ 6200. I was fortunate to sail in concierge class which gave me extra amenities, such as early boarding, private lunch in the dining room and extra in-room amenities such as welcome fresh fruit, daily afternoon canapes, custom bath amenities, and pillow menu to suit my sleeping preferences. 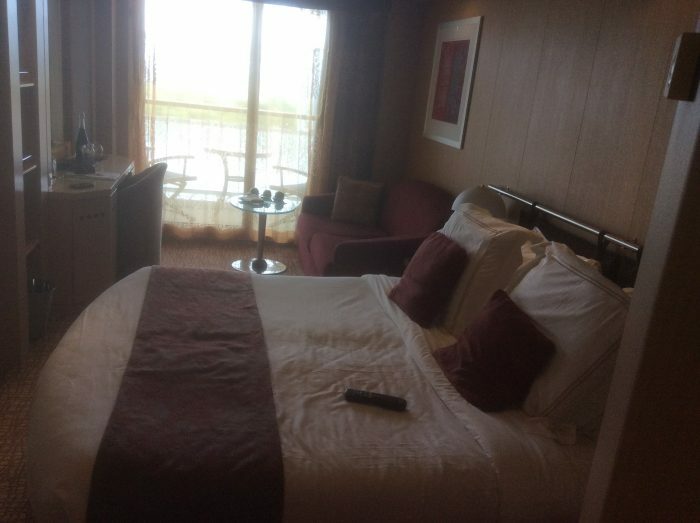 My stateroom was spacious and had plenty of storage space. The verandah was also spacious and was the perfect, relaxing location to enjoy early morning coffee. No smoking in the stateroom or verandah. I had a chance to eat at Oceanview Café, main dining room and the Tuscan Grille. The Oceanview Café had the best selection of foods from around the world. Fresh salad bar, soups were always hot, carving station etc. If you want custom made-to-order hamburgers, then you will venture to the Pool Grill. For crepes and sandwiches, visit Bristo on Five. The dimly lit Trellis Restaurant made it difficult at times to read your menu. Service was the best and the meals were top notch. Wait staff went above and beyond to make sure each guest was satisfied with their meal. The Tuscan Grille was a great steakhouse with an Italian flare. It was a dining experience that was not to be forgotten. My steak was cooked to perfection and the limoncello was a nice ending to our meal and well worth the coverage to eat here. In speaking with other passengers, many said that Qsine was the specialty restaurant not to miss. From what I understand it is a play on dishes from around the world presented with an element of surprise and delight. 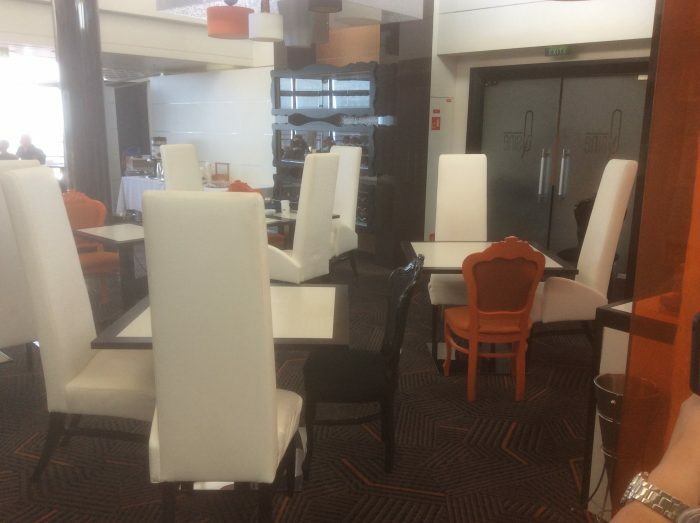 For those guests that book suites, they have their own private dining room called Luminae. Aqua class suite guests also have their own private dining room, Blu. 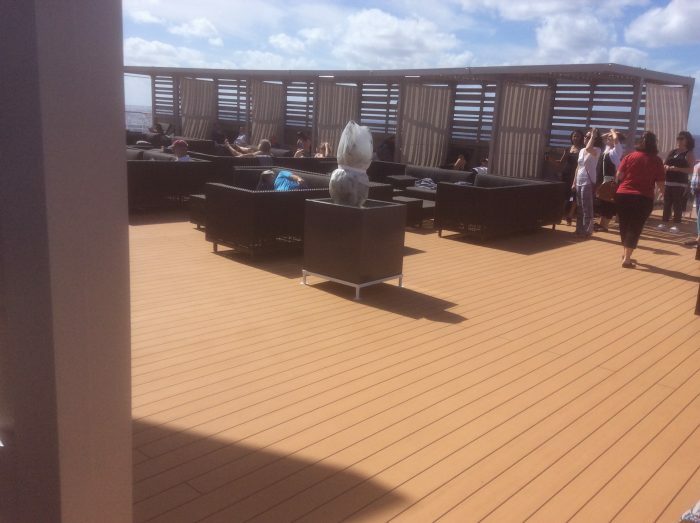 Celebrity Infinity has a new roof top area on board called Rooftop Terrace. 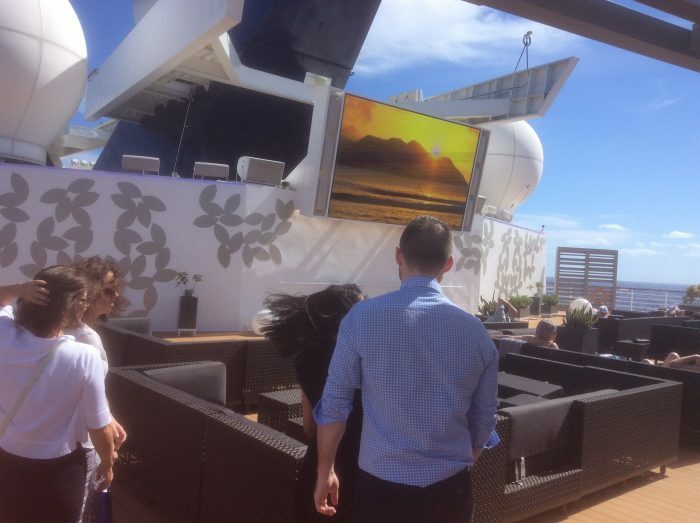 Here they feature movies while you just kick back and enjoy snacks and a cocktail. The hottest area on the Infinity in the evenings is the Martini Bar. One night during the week, it turns into a nightclub where bartenders put on a show and each guest wears headphones while they let loose, and have fun dancing to their own music. For those that enjoy wine, visit Cellar Masters. If you enjoy Caviar and Vodka, then Crush is your bar on board. The casino is non-smoking, which is a major plus if you’d like to try your luck. 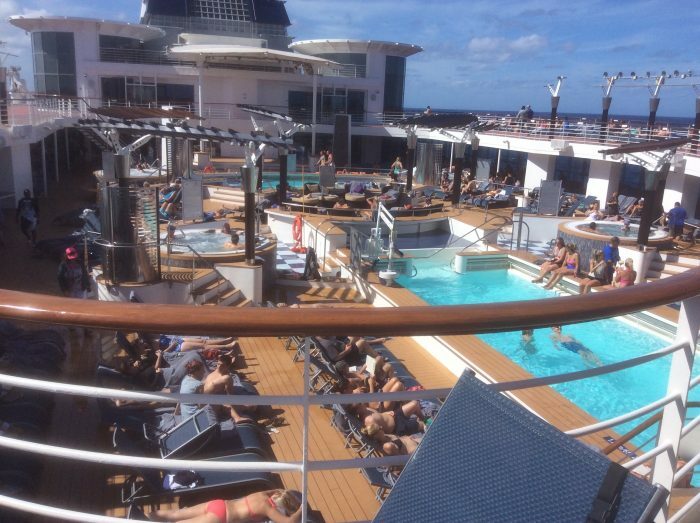 While on this cruise there were exciting activities that kept everyone busy both during the day and into the evening. 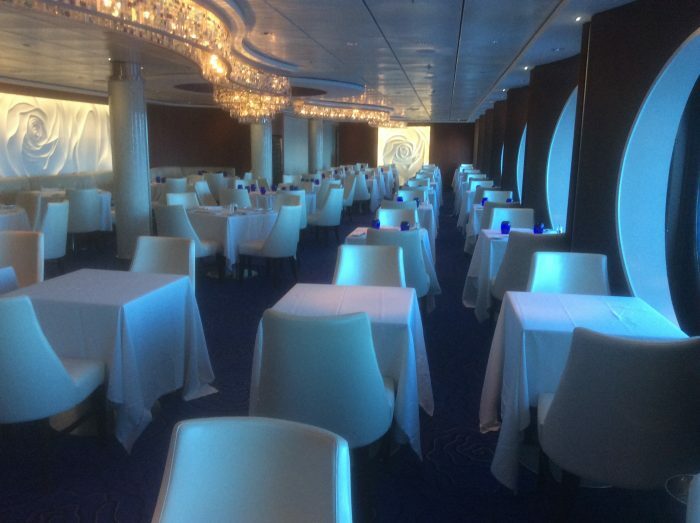 I would recommend Celebrity Infinity to anyone wishing to cruise on a midsize ship. Contact me for more information on your next cruise with Celebrity Cruises! This entry was posted on Tuesday, January 24th, 2017 at 5:44 pm	and is filed under All Inclusive, Bahamas, Caribbean, Celebrity, Celebrity Cruises, Cruise, Cruise Line, Destination, Food & Wine, Honeymoon, Luxury, Romance, Spa, Travel Type. You can follow any responses to this entry through the RSS 2.0 feed.